Located along the Lake Michigan shoreline in Leelanau County, Empire is about 30 minutes north of Frankfort. A small village of about 400 people, Empire is a destination for fishermen, nature enthusiasts, beach lovers and ice explorers. 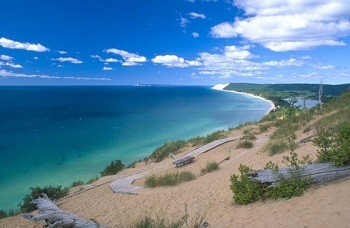 Discover Empire Bluffs, which offers the breathtaking views of Lake Michigan and the Sleeping Bear Dunes. Walk on one of the many trails within the natural area at the south end of Empire. Empire is home to the Empire Asparagus Festival during the month of May, which is a unique celebration of Spring. Sleeping Bear Dunes Visitor Center: An important spot for anyone looking to explore the Sleeping Bear Dunes, the center will give you all the information you need to fully enjoy the beautiful national park. Empire Bluffs Trail: Hike this easy 1.5 mile round trip trail and you will be rewarded with breathtaking views from a high bluff on Lake Michigan’s shoreline. Chippewa Run Natural Area: With over 100 acres of protected land, the area serves as a “Gateway to Empire” featuring an easy 1.5 mile trail, a historic apple orchard, a beaver pond and a large population of bird species. Empire Area Museum: With such features as Roen’s Saloon, a one-room schoolhouse, a blacksmith shop and several historical displays, there is much to explore in this museum about Empire’s history. Empire offers a very wide mix of shopping that offer everything you need while visiting this beautiful town nestled in the heart of the Sleeping Bear Dunes National Lakeshore. With a compact and very walkable downtown you’ll find everything from local art, artisan handmade chocolates, friendly restaurants and a well stocked hardware store. Within a short walking distance of downtown Empire, you can explore beautiful beaches, the Empire Area Museum and South Bar Lake. A trail within the Sleeping Bear Dune National Park. 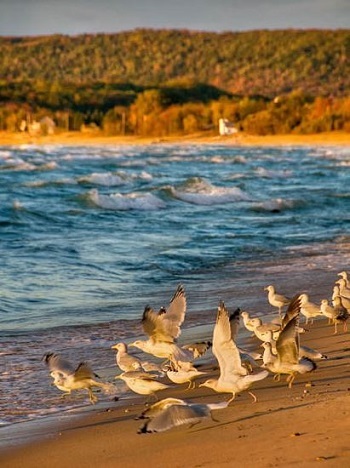 Home to the visitors center for the Sleeping Bear Dunes National Lakeshore, Empire is often a first stop for people looking to experience the beautiful dunes and trails along the Northern Michigan Coast. 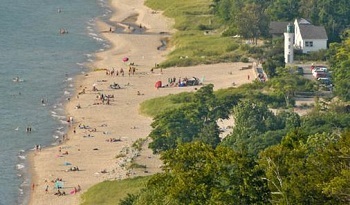 Empire has many of its own trails, including the Empire Bluffs Trail which has a spectacular view of the coast of Lake Michigan. 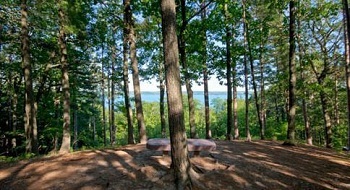 Just north of town is the Chippewa Run Natural Area with 112 protected acres of natural beauty. Located in the peaceful Village Park beach in Empire, the Robert H. Manning Memorial Lighthouse was built as a memorial in 1990 for long time resident Robert H. Manning. Mr. Manning enjoyed fishing offshore and often returned from those fishing trips late at night. He wished to see a lighthouse in the area to aid his navigation, so after his death in 1989, friends and relatives raised funds to build the lighthouse as a memorial. The 38-foot tall lighthouse is the second newest lighthouse in Michigan, and one of three memorial lights in Michigan.